The US West Coast eastern boundary upwelling system supports one of the most productive marine ecosystems in the world and is a primary source of ecosystem services for the US (e.g., fishing, shipping, and recreation). Long-term historical observations of physical and biological variables in this region have been collected since the 1950s (e.g., the CalCOFI program and now including the coastal ocean observing systems), leading to an excellent foundation for understanding the ecosystem impacts of dominant climate fluctuations such as the El Niño-Southern Oscillation (ENSO). In the northeast Pacific, ENSO impacts a wide range of physical and biotic processes, including temperature, stratification, winds, upwelling, and primary and secondary production. The El Niño phase of ENSO, in particular, can result in extensive geographic habitat range displacements and altered catches of fishes and invertebrates, and impact vertical and lateral export fluxes of carbon and other elements (Jacox et al., this issue; Anderson et al., this issue; Ohman et al., this issue). However, despite empirical observations and increased understanding of the coupling between climate and marine ecosystems along the US West Coast, there has been no systematic attempt to use this knowledge to forecast marine ecosystem responses to individual ENSO events. ENSO forecasting has become routine in the climate community. However, little has been done to forecast the impacts of ENSO on ecosystems and their services. This becomes especially important considering the occurrence of recent strong El Niño events (such as 2015-16) and climate model projections that suggest that ENSO extremes may become more frequent (Cai et al. 2015). The joint US CLIVAR/OCB/NOAA/PICES/ICES workshop on Forecasting ENSO impacts on marine ecosystems of the US West Coast (Di Lorenzo et al. 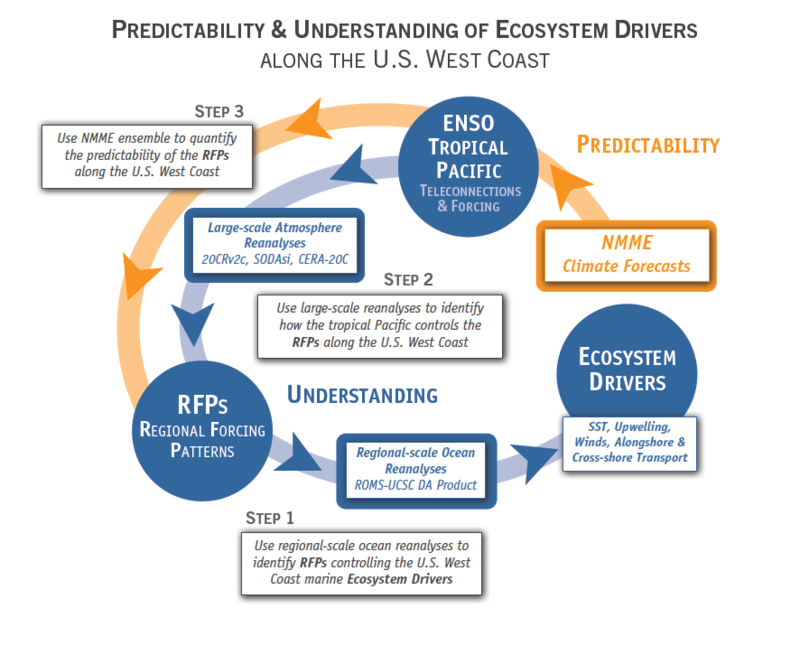 2017) held in La Jolla, California, in August 2016 outlined a three-step strategy to better understand and quantify the ENSO-related predictability of marine ecosystem drivers along the US West Coast (Figure 1). The first step is to use a high-resolution ocean reanalysis to determine the association between local ecosystem drivers and regional forcing patterns (RFPs). The identification of ecosystem drivers will depend on the ecosystem indicators or target species selected for prediction (Ohman et al., this issue). The second step is to objectively identify the tropical sea surface temperature (SST) patterns that optimally force the RFPs along the US West Coast region using available long-term large-scale reanalysis products. While the goal of the first two steps is to understand the dynamical basis for predictability (Figure 1, blue path), the final third step (Figure 1, orange path) aims at quantifying the predictability of the RFPs and estimating their prediction skill at seasonal timescales. This third step can be implemented using the output of multi-model ensemble forecasts such as the North America Multi-Model Ensemble (NMME) or by building efficient statistical prediction models such as Linear Inverse Models (LIMs; Newman et al. 2003). Figure 1. Framework for understanding and predicting ENSO impacts on ecosystem drivers. Blue path shows the steps that will lead to Understanding of the ecosystem drivers and their dependence on tropical Pacific anomalies. Orange path shows the steps that will lead to quantifying the Predictability of marine ecosystem drivers along the US West Coast that are predictable from large-scale tropical teleconnection dynamics. Important to the concept of ENSO predictability is the realization that the expressions of ENSO are very diverse and cannot be identified with a few indices (Capotondi et al. 2015; Capotondi et al., this issue). In fact, different expressions of sea surface temperature anomalies (SSTa) in the tropics give rise to oceanic and atmospheric teleconnections that generate different coastal impacts in the northeast Pacific. For this reason, we will refer to ENSO as the collection of tropical Pacific SSTa that lead to deterministic and predictable responses in the regional ocean and atmosphere along the US West Coast. In the sections below, we articulate in more detail the elements of the framework for quantifying the predictability of ENSO-related impacts on coastal ecosystems along the US West Coast (Figure 1). Our focus will be on the California Current System (CCS), reflecting the regional expertise of the workshop participants. Specifically, we discuss (1) the ecosystem drivers and what is identified as such; (2) RFP definitions; and (3) the teleconnections from the tropical Pacific and their predictability. The impacts of oceanic processes on the CCS marine ecosystem have been investigated since the 1950s when the long-term California Cooperative Oceanic Fisheries Investigations (CalCOFI) began routine seasonal sampling of coastal ocean waters. The CalCOFI program continues today and has been augmented with several other sampling programs (e.g., the coastal ocean observing network), leading to an unprecedented understanding of how climate and physical ocean processes, such as upwelling, drive ecosystem variability and change (e.g., see more recent reviews from King et al.2011; Ohman et al. 2013; Di Lorenzo et al. 2013). The dominant physical oceanographic drivers of ecosystem variability occur on seasonal, interannual, and decadal timescales and are associated with changes in (1) SST; (2) upwelling velocity; (3) alongshore transport; (4) cross-shore transport; and (5) thermocline/nutricline depth (see Ohman et al., this issue). This set of ecosystem drivers emerged from discussions among experts at the workshop. Ecosystem responses to these drivers include multiple trophic levels, including phytoplankton, zooplankton, small pelagic fish, and top predators, and several examples have been identified for the CCS (see summary table in Ohman et al., this issue). While much research has focused on diagnosing the mechanisms by which these physical drivers impact marine ecosystems, less is known about the dynamics controlling the predictability of these drivers. As highlighted in Ohman et al. (this issue), most of the regional oceanographic drivers (e.g., changes in local SST, upwelling, transport, thermocline depth) are connected to changes in large-scale forcings (e.g., winds, surface heat fluxes, large-scale SST and sea surface height patterns, freshwater fluxes, and remotely forced coastally trapped waves entering the CCS from the south). In fact, several studies have documented how large-scale changes in wind patterns associated with the Aleutian Low and the North Pacific Oscillation drive oceanic modes of variability such as the Pacific Decadal Oscillation and the North Pacific Gyre Oscillation (Mantua et al. 1997; Di Lorenzo et al. 2008; Chhak et al. 2009; Ohman et al., this issue; Jacox et al., this issue; Anderson et al., this issue; Capotondi et al., this issue) that influence the CCS. However, these large-scale modes only explain a fraction of the ecosystem’s atmospheric forcing functions at the regional-scale. Thus, it is important to identify other key forcings to gain a more complete mechanistic understanding of CCS ecosystem drivers (e.g., Jacox et al. 2014; 2015). The dominant large-scale quantities that control the CCS ecosystem drivers are winds, heat fluxes, and remotely forced coastally trapped waves (Hickey 1979). Regional expressions or patterns of these large-scale forcings have been linked to changes in local stratification and thermocline depth (Veneziani et al. 2009a; 2009b; Combes et al. 2013), cross-shore transport associated with mesoscale eddies (Kurian et al. 2011; Todd et al. 2012; Song et al. 2012; Davis and Di Lorenzo 2015b), and along-shore transport (Davis and Di Lorenzo 2015a; Bograd et al. 2015). For this reason, we define the regional expressions of the atmospheric and remote wave forcing that are optimal in driving SST, ocean transport, upwelling, and thermocline depth as the RFPs. To clarify this concept, consider the estimation of coastal upwelling velocities. While a change in the position and strength in the Aleutian Low has been related to coastal upwelling in the northern CCS, a more targeted measure of the actual upwelling vertical velocity and nutrient fluxes that are relevant to primary productivity can only be quantified by taking into account a combination of oceanic processes that depend on multiple RFPs such as thermocline depth (e.g., remote waves), thermal stratification (e.g., heat fluxes), mesoscale eddies, and upwelling velocities (e.g., local patterns of wind stress curl and alongshore winds; see Gruber et al 2011; Jacox et al. 2015; Renault et al. 2016). In other words, if we consider the vertical coastal upwelling velocity (w) along the northern CCS, a more adequate physical description and quantification would be given from a linear combination of the different regional forcing functions w = Σn ∝n * RFPn rather than w = ∝*Aleutian Low. The largest interannual variability in the Pacific that impacts the RFPs is ENSO, which also constitutes the largest source of seasonal (3-6 months) predictability. During El Niño and La Niña, atmospheric and oceanic teleconnections from the tropics modify large-scale and local surface wind patterns and ocean currents of the CCS and force coastally trapped waves. While ENSO exerts important controls on the RFPs in the CCS, it has become evident that ENSO expressions in the tropics vary significantly from event to event, leading to different responses in the CCS (Capotondi et al., this issue). Also, as previously pointed out, the CCS is not only sensitive to strong ENSO events but more generally responds to a wide range of tropical SSTa variability that is driven by ENSO-type dynamics in the tropical and sub-tropical Pacific. For this reason, we define an “ENSO teleconnection” as any RFP response that is linked to ENSO-type variability in the tropics. ENSO can influence the upwelling and circulation in the CCS region through both oceanic and atmospheric pathways. It is well known that equatorial Kelvin waves, an integral part of ENSO dynamics, propagate eastward along the Equator and continue both northward (and southward) along the coasts of the Americas as coastally trapped Kelvin waves after reaching the eastern ocean boundary. El Niño events are associated with downwelling Kelvin waves, leading to a deepening of the thermocline, while La Niña events produce a shoaling of the thermocline in the CCS (Simpson 1984; Lynn and Bograd 2002; Huyer et al. 2002; Bograd et al. 2009; Hermann et al. 2009; Miller et al. 2015). The offshore scale of coastal Kelvin waves decreases with latitude, and the waves decay while propagating northward along the coast due to dissipation and radiation of westward propagating Rossby waves. In addition, topography and bathymetry can modify the nature of the waves and perhaps partially impede their propagation at some location. Thus, the efficiency of coastal waves of equatorial origin in modifying the stratification in the CCS is still a matter of debate. To complicate matters, regional wind variability south of the CCS also excites coastally trapped waves, which supplement the tropical source. In the tropics, SST anomalies associated with ENSO change tropical convection and excite mid-troposphere stationary atmospheric Rossby waves that propagate signals to the extratropics, the so-called atmospheric ENSO teleconnections (Capotondi et al., this issue). Through these atmospheric waves, warm ENSO events favor a deepening and southward shift of the Aleutian Low pressure system that is dominant during winter, as well as changes in the North Pacific Subtropical High that is dominant during spring and summer, resulting in a weakening of the alongshore winds, reduced upwelling, and warmer surface water. These changes are similar to those induced by coastal Kelvin waves of equatorial origin, making it very difficult to distinguish the relative importance of the oceanic and atmospheric pathways in the CCS. In addition, due to internal atmospheric noise, the details of the ENSO teleconnections can vary significantly from event to event and result in important differences along the California Coast (Figure 2). Figure 2. Schematic of ENSO teleconnection associated with different flavors of tropical SSTa. (a) Atmospheric teleconnections of the canonical eastern Pacific El Niño tend to impact the winter expression of the Aleutian Low, which in turn drives an oceanic SSTa anomaly that projects onto the pattern of the Pacific Decadal Oscillation (PDO). (b) Atmospheric teleconnections of the central Pacific El Niño tend to impact the winter expression of the North Pacific High, which in turn drives an oceanic SSTa anomaly that projects onto the pattern of the North Pacific Gyre Oscillation (NPGO). The ENSO SSTa maps are obtained by regressing indices of central and eastern Pacific ENSO with SSTa. The other maps are obtained by regression of SSTa/SLPa with the PDO (a) and NPGO (b) indices. El Niño events exhibit a large diversity in amplitude, duration, and spatial pattern (Capotondi et al. 2015). The amplitude and location of the maximum SST anomalies, whether in the eastern (EP) or central (CP) Pacific, can have a large impact on ENSO teleconnections (Ashok et al. 2007; Larkin and Harrison 2005). While “canonical” EP events induce changes in the Aleutian Low (Figure 2b), CP events have been associated with a strengthening of the second mode of North Pacific atmospheric variability, the North Pacific Oscillation (NPO; Figure 2a; Di Lorenzo et al. 2010; Furtado et al. 2012). In addition, it is conceivable that EP events have a larger Kelvin wave signature than CP events, resulting in different oceanic influences in the CCS. In summary, while the ENSO influence on the CCS physical and biological environments is undeniable, several sources of uncertainty remain about the details of that influence. This uncertainty arises in the physical environment on seasonal timescales from many sources, including the diversity of ENSO events, the intrinsic unpredictable components of the atmosphere, and the intrinsic unpredictable eddy variations in the CCS. We also need to distinguish between physically forced ecosystem response versus intrinsic biological variability, which is potentially nonlinear and likely unpredictable. Skill levels need to be quantified for each step of the prediction process (i.e., ENSO, teleconnections, local oceanic response, local ecosystem response) relative to a baseline—for example the persistence of initial condition, which is also being exploited for skillful predictions of the large marine ecosystem at the seasonal timescale (Tommasi et al., this issue). The target populations should be exploitable species that are of interest to federal and state agencies that regulate certain stocks. Models are currently being developed to use ocean forecasts to advance top predator management (Hazen et al., this issue). The implementation of this framework (Figure 1) for practical uses will require a collaborative effort between physical climate scientists with expertise in predicting and understanding ENSO and biologists who have expertise in understanding ecosystem response to physical climate forcing. Bograd, S. J., M. Pozo Buil, E. Di Lorenzo, C. G. Castro, I. D. Schroeder, R. Goericke, C. R. Anderson, C. Benitez-Nelson, and F. A. Whitney, 2015: Changes in source waters to the Southern California Bight. Deep-Sea Res. Part II-Top. Stud. Oceanogr., 112, 42-52, doi:10.1016/j.dsr2.2014.04.009. Bograd, S. J., I. Schroeder, N. Sarkar, X. Qiu, W. J. Sydeman, and F. B. Schwing, 2009: Phenology of coastal upwelling in the California Current. Geophy. Res. Lett., 36, doi: 10.1029/2008GL035933. Cai, W. J., and Coauthors, 2015: ENSO and greenhouse warming. Nature Climate Change, 5, 849-859, doi:10.1038/nclimate2743. Capotondi, A., and Coauthors, 2015: Understanding ENSO Diversity. Bull. Amer. Meteor. Soc., 96, 921-938, doi:10.1175/BAMS-D-13-00117.1. Chhak, K. C., E. Di Lorenzo, N. Schneider, and P. F. Cummins, 2009: Forcing of low-frequency ocean variability in the northeast Pacific. J. Climate, 22, 1255-1276, doi:10.1175/2008jcli2639.1. Davis, A., and E. Di Lorenzo, 2015a: Interannual forcing mechanisms of California Current transports I: Meridional Currents. Deep-Sea Res. Part II-Top. Stud. Oceanogr., 112, 18-30, doi:10.1016/j.dsr2.2014.02.005. Davis, A., and E. Di Lorenzo, 2015b: Interannual forcing mechanisms of California Current transports II: Mesoscale eddies. Deep-Sea Res. Part II-Top. Stud. Oceanogr., 112, 31-41, doi:10.1016/j.dsr2.2014.02.004. Di Lorenzo, E., and Coauthors, 2017: Forecasting ENSO impacts on marine ecosystems of the US West Coast, Joint US CLIVAR/NOAA/PICES/ICES Report, https://usclivar.org/meetings/2016-enso-ecosystems, forthcoming. Di Lorenzo, E., and Coauthors, 2008: North Pacific Gyre Oscillation links ocean climate and ecosystem change. Geophys. Res. Lett., 35, doi:10.1029/2007gl032838. Di Lorenzo, E., and Coauthors, 2013: Synthesis of Pacific Ocean climate and ecosystem dynamics. Oceanogr., 26, 68-81, doi: 10.5670/oceanog.2013.76. Di Lorenzo, E., K. M. Cobb, J. C. Furtado, N. Schneider, B. T. Anderson, A. Bracco, M. A. Alexander, and D. J. Vimont, 2010: Central Pacific El Nino and decadal climate change in the North Pacific Ocean. Nature Geosci., 3, 762-765, doi:10.1038/ngeo984. 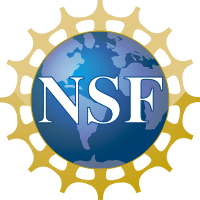 Furtado, J. C., E. Di Lorenzo, B. T. Anderson, and N. Schneider, 2012: Linkages between the North Pacific Oscillation and central tropical Pacific SSTs at low frequencies. Climate Dyn., 39, 2833-2846, doi:10.1007/s00382-011-1245-4. Gruber, N., Z. Lachkar, H. Frenzel, P. Marchesiello, M. Munnich, J. C. McWilliams, T. Nagai, and G. K. Plattner, 2011: Eddy-induced reduction of biological production in eastern boundary upwelling systems. Nature Geosci., 4, 787-792, doi:10.1038/ngeo1273. Hermann, A. J., E. N. Curchitser, D. B. Haidvogel, and E. L. Dobbins, 2009: A comparison of remote vs. local influence of El Nino on the coastal circulation of the northeast Pacific. Deep Sea Res. Part II: Top. Stud. Oceanogr., 56, 2427-2443, doi: 10.1016/j.dsr2.2009.02.005. Hickey, B. M., 1979. The California Current system—hypotheses and facts. Prog. Oceanogr., 8, 191-279, doi: 10.1016/0079-6611(79)90002-8. Huyer, A., R. L. Smith, and J. Fleischbein, 2002: The coastal ocean off Oregon and northern California during the 1997–8 El Nino. Prog. Oceanogr., 54, 311-341, doi: 10.1016/S0079-6611(02)00056-3. Jacox, M. G., A. M. Moore, C. A. Edwards, and J. Fiechter, 2014: Spatially resolved upwelling in the California Current System and its connections to climate variability. Geophy. Res. Lett., 41, 3189-3196, doi:10.1002/2014gl059589. Jacox, M. G., J. Fiechter, A. M. Moore, and C. A. Edwards, 2015: ENSO and the California Current coastal upwelling response. J. Geophy. Res.-Oceans, 120, 1691-1702, doi:10.1002/2014jc010650. Jacox, M. G., S. J. Bograd, E. L. Hazen, and J. Fiechter, 2015: Sensitivity of the California Current nutrient supply to wind, heat, and remote ocean forcing. Geophys. Res. Lett., 42, 5950-5957, doi:10.1002/2015GL065147. Jacox, M. G., E. L. Hazen, K. D. Zaba, D. L. Rudnick, C. A. Edwards, A. M. Moore, and S. J. Bograd, 2016: Impacts of the 2015-2016 El Niño on the California Current System: Early assessment and comparison to past events. Geophys. Res. Lett., 43, 7072-7080, doi:10.1002/2016GL069716. King, J. R., V. N. Agostini, C. J. Harvey, G. A. McFarlane, M. G. G. Foreman, J. E. Overland, E. Di Lorenzo, N. A. Bond, and K. Y. Aydin, 2011: Climate forcing and the California Current ecosystem. Ices J. Mar. Sci., 68, 1199-1216, doi:10.1093/icesjms/fsr009. Kurian, J., F. Colas, X. Capet, J. C. McWilliams, and D. B. Chelton, 2011: Eddy properties in the California Current System. J. Geophy. Res.-Oceans, 116, doi:10.1029/2010jc006895. Larkin, N. K. and D. E. Harrison, 2005: On the definition of El Niño and associated seasonal average US weather anomalies. Geophy. Res. Lett. 32, doi: 10.1029/2005GL022738. Lynn, R. J. and S. J. Bograd, 2002: Dynamic evolution of the 1997–1999 El Niño–La Niña cycle in the southern California Current system. Prog. Oceanogr., 54, 59-75, doi: 10.1016/S0079-6611(02)00043-5. Mantua, N. J., S. R. Hare, Y. Zhang, J. M. Wallace, and R. C. Francis, 1997: A Pacific interdecadal climate oscillation with impacts on salmon production. Bull. Amer. Meteorol. Soc., 78, 1069-1079, doi:10.1175/1520-0477(1997)078<1069:apicow>2.0.co;2. Marchesiello, P., J. C. McWilliams, and A. Shchepetkin, 2003: Equilibrium structure and dynamics of the California Current System. J. Phys. Oceanogr., 33, 753-783, doi: 10.1175/1520-0485(2003)33<753:ESADOT>2.0.CO;2. McCreary, J. P., P. K. Kundu, and S. Y. Chao, 1987: On the dynamics of the California Current System. J. Mar. Res., 45, 1-32, doi: 10.1357/002224087788400945. Miller, A. J., H. Song, and A. C. Subramanian, 2015: The physical oceanographic environment during the CCE-LTER Years: Changes in climate and concepts. Deep Sea Res. Part II: Top. Stud. Oceanogr., 112, 6-17, doi: 10.1016/j.dsr2.2014.01.003. Newman, M., and Coauthors, 2016: The Pacific Decadal Oscillation, Revisited. J. Climate, 29, 4399-4427, doi:10.1175/jcli-d-15-0508.1. Ohman, M. D., K. Barbeau, P. J. S. Franks, R. Goericke, M. R. Landry, and A. J. Miller, 2013: Ecological transitions in a coastal upwelling ecosystem. Oceanogr., 26, 210-219, doi: 10.5670/oceanog.2013.65. Renault, L., C. Deutsch, J. C. McWilliams, H. Frenzel, J.-H. Liang, and F. Colas, 2016: Partial decoupling of primary productivity from upwelling in the California Current system. Nature Geosci, 9, 505-508, doi:10.1038/ngeo2722. Simpson, J. J., 1984; El Nino‐induced onshore transport in the California Current during 1982‐1983. Geophy. Res. Lett., 11, 233-236, doi: 10.1029/GL011i003p00233. Song, H., A. J. Miller, B. D. Cornuelle, and E. Di Lorenzo, 2011: Changes in upwelling and its water sources in the California Current System driven by different wind forcing. Dyn. Atmos. Oceans, 52, 170-191, doi:10.1016/j.dynatmoce.2011.03.001. Todd, R. E., D. L. Rudnick, M. R. Mazloff, B. D. Cornuelle, and R. E. Davis, 2012: Thermohaline structure in the California Current System: Observations and modeling of spice variance. J. Geophy. Res.-Oceans, 117, doi:10.1029/2011jc007589. Veneziani, M., C. A. Edwards, J. D. Doyle, and D. Foley, 2009: A central California coastal ocean modeling study: 1. Forward model and the influence of realistic versus climatological forcing. J. Geophy. Res.-Oceans, 114, doi:10.1029/2008jc004774. Veneziani, M., C. A. Edwards, and A. M. Moore, 2009: A central California coastal ocean modeling study: 2. Adjoint sensitivities to local and remote forcing mechanisms. J. Geophy. Res.-Oceans, 114, doi:10.1029/2008jc004775. The El Niño–Southern Oscillation (ENSO) is a dominant driver of interannual variability in the physical and biogeochemical state of the northeast Pacific, and, consequently, exerts considerable control over the ecological dynamics of the California Current System (CCS). In the CCS, upwelling is the proximate driver of elevated biological production, as it delivers nutrients to the sunlit surface layer of the ocean, stimulating growth of phytoplankton that form the base of the marine food web. Much of the ecosystem variability in the CCS can, therefore, be attributed to changes in bottom-up forcing, which regulates biogeochemical dynamics through a range of mechanisms. Of particular relevance to ENSO-driven variability are the influences of surface winds (which drive upwelling and downwelling), remote oceanic forcing by coastal wave propagation, and alongshore advection. While the relative importance of these individual forcing mechanisms has long been a topic of study, there is general consensus on the qualitative nature of each, and we discuss them in turn below. One of the canonical mechanisms by which ENSO events generate an oceanographic response in the CCS is through modification of the surface winds and resultant upwelling. During El Niño, tropical convection excites atmospheric Rossby waves that strengthen and displace the Aleutian low, producing anomalously weak equatorward (or strong poleward) winds, which in turn drive anomalously weak upwelling (or strong downwelling) through modification of cross-shore Ekman transport near the surface (Alexander et al. 2002; Schwing et al. 2002). The opposite response is associated with La Niña. This tropical-extratropical communication through the atmosphere has been given the shorthand name “atmospheric teleconnection.” When equatorward winds are anomalously weak, as they were for example during the 2009-2010 El Niño (Todd et al. 2011), there is a twofold impact on the nutrient flux to the euphotic zone and, consequently, the potential primary productivity. First, weaker winds produce weaker coastal upwelling; independent of changes in the nutrient concentration of upwelling source waters, a reduction in vertical transport translates directly to a reduction in vertical nutrient flux. Second, the nutrient concentration of source waters is altered by the strength of the wind; weak upwelling draws from shallower depths than strong upwelling, and the water that is upwelled is relatively nutrient-poor. Both of these effects tend to limit potential productivity during El Niño. Conversely, La Niña events are associated with anomalously strong equatorward winds, vigorous coastal upwelling, and an ample supply of nutrients to the euphotic zone. However, winds that are too strong can also export nutrients and plankton rapidly offshore, resulting in relatively low phytoplankton biomass in the nearshore region (Figure 1; Jacox et al. 2016a). Figure 1. Surface chlorophyll plotted as a function of alongshore wind stress and subsurface nitrate concentration in the central CCS. 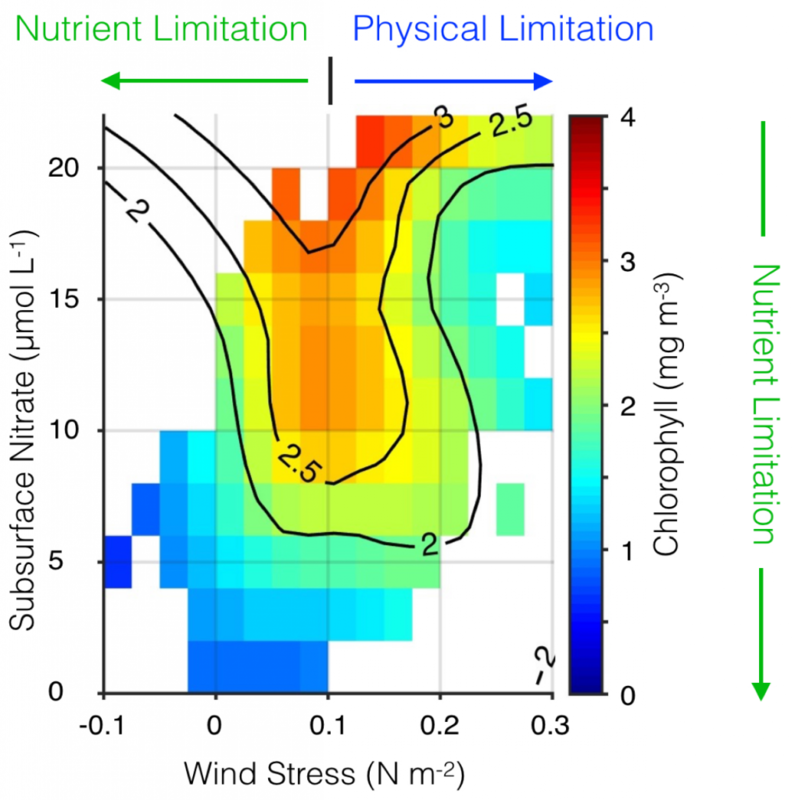 Wind stress is from the UC Santa Cruz Regional Ocean Model System (ROMS) CCS reanalysis (oceanmodeling.ucsc.edu); nitrate comes from the CCS reanalysis combined with a salinitytemperature-nitrate model developed with World Ocean Database data; and chlorophyll is from the SeaWiFS ocean color sensor. Surface chlorophyll is highest when winds are moderate and subsurface nutrient concentrations are high. Phytoplankton biomass can be hindered by weak upwelling, nitrate-poor source waters, or physical processes (subduction or rapid offshore advection of nutrients and/or phytoplankton, light limitation due to a deep mixed layer) driven by strong winds. Adapted from Jacox et al. (2016a). In addition to the magnitude of alongshore wind stress, its spatial structure is also important in dictating the ocean’s physical and biogeochemical response. Off the US West Coast, the first mode of interannual upwelling variability is a cross-shore dipole, where anomalously strong nearshore upwelling (within ~50 km of the coast) is accompanied by anomalously weak upwelling farther offshore (Jacox et al. 2014). In terms of the surface wind field, this pattern represents a fluctuation between cross-shore wind profiles with (i) weak nearshore winds and a wide band of positive wind stress curl, and (ii) strong nearshore winds and a narrow band of positive curl. The former, which is associated with positive phases of the Pacific Decadal Oscillation (PDO) and ENSO and negative phases of the North Pacific Gyre Oscillation (NPGO), may favor smaller phyto- and zooplankton, while the latter, associated with negative phases of the PDO and ENSO and positive phases of the NPGO, may favor larger phyto- and zooplankton (Rykaczewski and Checkley 2008). As the atmospheric teleconnection transmits tropical variability to CCS winds, an oceanic teleconnection exists in the form of coastally trapped waves that propagate poleward along an eastern ocean boundary and thus approach the CCS from the south (Enfield and Allen 1980; Meyers et al. 1998; Strub and James 2002). During an El Niño, these waves tend to deepen the pycnocline and nutricline, which renders upwelling less effective at drawing nutrients to the surface and, therefore, limits potential productivity. While coastally trapped waves that reach the CCS may originate as far away as the equator, topographic barriers exist, notably at the mouth of the Gulf of California (Ramp et al. 1997; Strub and James 2002) and at Point Conception. Since coastally trapped waves that reach a particular location in the CCS can be generated by wind forcing anywhere along the coast equatorward of that location, the oceanic teleconnection may be thought of as an integration of wind forcing experienced along the equator and all the way up the coast to the CCS. Efforts to separate the effects of local wind forcing from coastally trapped waves are complicated by the strong correlation of alongshore wind along the coast, the fast poleward propagation speed of coastally trapped waves, and the fact that both produce similar effects during canonical El Niño and La Niña events. The 2015-16 El Niño is one example in which warm water and deep isopycnals were observed in the southern CCS despite anomalous local upwelling-favorable winds (Jacox et al. 2016b). In this case, the local winds may have dampened the influence of the oceanic teleconnection (Frischknecht et al. 2017). Coastally trapped waves are also likely important in setting up an alongshore pressure gradient. The barotropic alongshore pressure gradient influences local upwelling dynamics, as it is balanced primarily by the Coriolis force associated with onshore flow (Connolly et al. 2014). This onshore geostrophic flow acts in opposition to the wind-driven offshore Ekman transport, such that net offshore transport (and consequently upwelling) is less than the Ekman transport (Marchesiello and Estrade 2010). The magnitude of the alongshore pressure gradient is positively correlated with ENSO indices, so it tends to further reduce upwelling during El Niño events, exacerbating the influence of anomalously weak equatorward winds (Jacox et al. 2015). Anomalous alongshore transport has on several occasions been implicated in major ecosystem changes in the CCS. In the case of anomalous advection from the north, as observed in 2002 (Freeland et al. 2003), the CCS is supplied by cold, fresh, and nutrient-rich subarctic water that can stimulate high productivity, even in the absence of strong upwelling. Conversely, anomalous advection of surface waters from the south, as observed during the 1997-98 El Niño (Bograd and Lynn 2001; Lynn and Bograd 2002; Durazo and Baumgartner 2002) may amplify surface warming and water column stratification, intensifying nutrient limitation and biological impacts associated with the atmospheric and oceanic teleconnections. The poleward flowing California Undercurrent (CUC) may also be modulated by ENSO variability. In particular, there is evidence that strong El Niño events can intensify the CUC (Durazo and Baumgartner 2002; Lynn and Bograd 2002; Gomez-Valdivia et al. 2015), which transports relatively warm, salty, and nutrient-rich water along the North American coast from the tropical Pacific as far north as Alaska (Thomson and Krassovski 2010). Anomalously warm salty water was observed on subsurface isopycnals in the southern CUC during 2015-2016 (Rudnick et al. 2016), suggesting anomalous advection from the south. It is unclear whether coastal upwelling can reach deep enough during El Niño events to draw from the CUC, but if so, the CUC intensification could be a mechanism for modifying upwelling source waters and partially mitigating the previously described impacts on nutrient supply. Finally, in addition to influencing the ecosystem through bottom-up forcing, anomalous surface and subsurface currents can directly influence the ecological landscape by transporting species into the CCS from the north, south, or west. For example, positive phases of ENSO and the PDO are associated with higher biomass of warm-water ‘southern’ copepods, while negative phases of ENSO and the PDO are associated with increases in cold-water ‘northern’ copepods (Hooff and Peterson 2006). Importantly, northern copepods are much more lipid-rich than southern copepods; thus, changes in the copepod composition alter the energy available to higher trophic levels and have been implicated in changing survival for forage fish, salmon, and seabirds (Sydeman et al. 2011). During El Niño events, the appearance of additional warm water species (e.g., pelagic red crabs) off the California coast has also been attributed to anomalous poleward advection, though further research is needed to support this hypothesis. While El Niño and La Niña events have specific global and regional patterns associated with them, each ENSO event is unique, both in its evolution and its regional impacts (Capotondi et al. 2015), exemplified by events of the past several years. The tropical evolution of the 2015-16 El Niño was reasonably well predicted by climate models (L’Heureux et al. 2016), in contrast to 2014-15 when a predicted El Niño failed to materialize (McPhaden 2015). However, even in the strong 2015-16 El Niño there were notable exceptions from the expected effects of a strong El Niño, including a lack of increased precipitation over the Southwestern and South Central United States (L’Heureux et al. 2016). Similarly, subsurface ocean anomalies off Central and Southern California were weaker in 2015-16 than they were during the 1982-83 and 1997-98 El Niños (Jacox et al. 2016b), and the 2015-16 El Niño occurred against a backdrop of widespread pre-existing anomalous conditions in the northeast Pacific. Figure 2. Temperature anomaly at 50 m depth from the California Underwater Glider Network, averaged over the inshore 50 km and filtered with a 3-month running mean. Lines have traditional CalCOFI designations 66.7 (Monterey Bay), 80.0 (Point Conception), and 90.0 (Dana Point). The Oceanic Niño Index (a 3-month running mean of the Niño 3.4 SST anomaly) is plotted for reference. In light of ENSO’s diverse expressions in the CCS, it is desirable to develop indices that capture variability in the CCS rather than to rely solely on tropical indices with uncertain connections to the North American West Coast. For one such index, we turn to data from the California Underwater Glider Network (CUGN), which has sustained observations along California Cooperative Oceanic Fisheries Investigations (CalCOFI) lines 66.7 (Monterey Bay), 80.0 (Point Conception), and 90.0 (Dana Point) since 2007. The temperature anomaly at 50 m depth averaged over the inshore 50 km is calculated using a climatology of CUGN data (Figure 2; Rudnick et al. 2016). The choice of 50 m depth is consistent with the mean depth of the thermocline, and averaging over the inshore 50 km is intended to focus on the region of coastal upwelling. Anomalously warm water is largely the result of anomalously weak upwelling or strong downwelling. 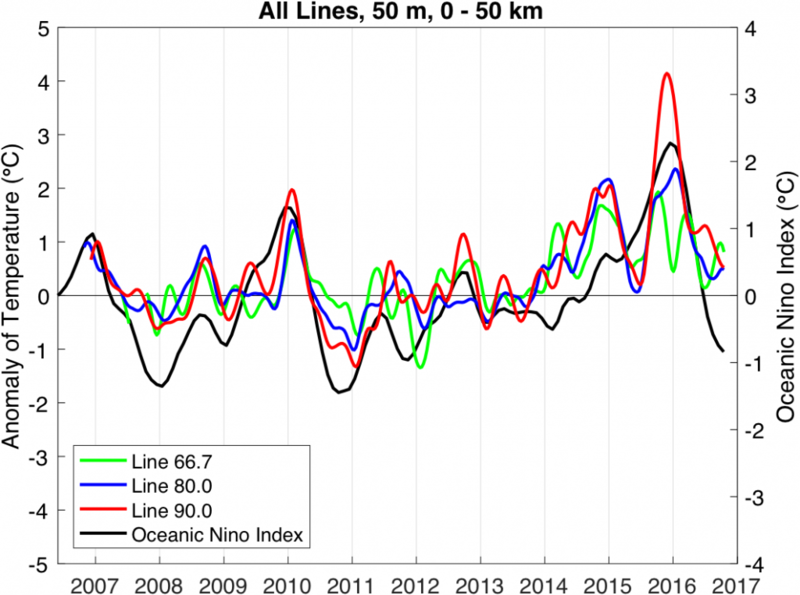 Results from all three lines are shown along with the Oceanic Niño Index, a measure of sea surface temperature in the central equatorial Pacific (Figure 2). The major events of the past decade include the El Niño/La Niña of 2009-11, and the dramatic recent warming that started in 2014 and extended through the El Niño that ended in 2016. The two recent warm periods of 2014-15 (Zaba and Rudnick 2016) and 2015-16 are of note, as they extended along the coast between lines 90.0 and 66.7. While the equatorial Pacific is experiencing La Niña conditions, as of December 2016, anomalous warmth is lingering in the CCS. Time-series such as those in Figure 2 demonstrate the value of the CUGN, which provides direct observations of the vertical structure of the ocean and has been sustained over the past decade along three transects in the CCS. These observations can also be used in conjunction with ocean models and observations from other platforms to observe the physical state of the CCS in near real-time and place it in the context of historical variability, including ENSO-driven variability, spanning decades (e.g. Jacox et al., 2016b). Alexander, M. A., I. Bladé, M. Newman, J. R. Lanzante, N. C. Lau, and J. D. Scott, 2002: The atmospheric bridge: The influence of ENSO teleconnections on air-sea interaction over the global oceans. J. Climate, 15, 2205–2231, doi: 10.1175/1520-0442(2002)015<2205:TABTIO>2.0.CO;2. Bograd, S. J., and R. J. Lynn, 2001: Physical-biological coupling in the California Current during the 1997–1999 El Niño-La Niña cycle. Geophys. Res. Lett., 28, 275–278, doi: 10.1029/2000GL012047. Capotondi, A., and Coauthors 2015: Understanding ENSO diversity. Bull. Amer. Meteor. Soc., 96, 921-938, doi: 10.1175/BAMS-D-13-00117.1. Connolly, T. P., B. M. Hickey, I. Shulman, and R. E. Thomson, 2014: Coastal trapped waves, alongshore pressure gradients, and the California undercurrent. J. Phys. Oceanogr., 44, 319-342, doi: 10.1175/JPO-D-13-095.1. Durazo, R., and T. Baumgartner, 2002: Evolution of oceanographic conditions off Baja California: 1997–1999, Prog. Oceanogr., 54, 7–31, doi: 10.1016/S0079-6611(02)00041-1. Enfield, D., and J. Allen, 1980: On the structure and dynamics of monthly mean sea-level anomalies along the Pacific coast of North and South-America. J. Phys. Oceanogr., 10. Doi: 10.1175/1520-0485(1980)010<0557:OTSADO>2.0.CO;2. Frischknecht, M., M. Münnich, and N. Gruber, 2017: Local atmospheric forcing driving an unexpected California Current System response during the 2015‐2016 El Niño. Geophys. Res. Lett., doi: 10.1002/2016GL071316. Freeland, H. J., G. Gatien, A. Huyer, and R. L. Smith, 2003: Cold halocline in the northern California Current: An invasion of subarctic water. Geophys. Res. Lett. 30, doi: 10.1029/2002GL016663. Gómez-Valdivia, F., A. Parés-Sierra, and A. L. Flores-Morales, 2015: The Mexican Coastal Current: A subsurface seasonal bridge that connects the tropical and subtropical Northeastern Pacific. Contin. Shelf Res., 110, 100-107, doi: 10.1016/j.csr.2015.10.010. Hooff, R. C., and W. T. Peterson, 2006: Copepod biodiversity as an indicator of changes in ocean and climate conditions of the northern California current ecosystem. Limnol. Oceanogr., 51, 2607-2620, doi: 10.4319/lo.2006.51.6.2607. Jacox, M. G., A. M. Moore, C. A. Edwards, and J. Fiechter, 2014: Spatially resolved upwelling in the California Current System and its connections to climate variability. Geophys. Res. Lett., 41, 3189–3196, doi:10.1002/2014GL059589. Jacox, M. G., S. J. Bograd, E. L. Hazen, and J. Fiechter, 2015: Sensitivity of the California Current nutrient supply to wind, heat, and remote ocean forcing. Geophys. Res. Lett., 42, 5950–5957, doi:10.1002/2015GL065147. Jacox, M., E. Hazen, and S. Bograd, 2016a: Optimal environmental conditions and anomalous ecosystem responses: Constraining bottom-up controls of phytoplankton biomass in the California Current System. Sci. Rep., 6, 7612-27612, doi:10.1038/srep27612. Jacox, M., E. L. Hazen, K. D. Zaba, D. L. Rudnick, C. A. Edwards, A. M. Moore, and S. J. Bograd, 2016b: Impacts of the 2015–2016 El Niño on the California Current System: Early assessment and comparison to past events. Geophys. Res. Lett. 43, 7072-7080, doi:10.1002/2016GL069716. L’Heureux, M., and Coauthors, 2016: Observing and predicting the 2015-16 El Niño. Bull. Amer. Meteor. Soc. doi:10.1175/BAMS-D-16-0009.1. Lynn, R. J., and S. J. Bograd, 2002: Dynamic evolution of the 1997–1999 El Niño-La Niña cycle in the southern California Current System. Prog. Oceanogr., 54, 59–75, doi: 10.1016/S0079-6611(02)00043-5. Marchesiello, P., and P. Estrade, 2010: Upwelling limitation by onshore geostrophic flow. J. Mar. Res., 68, 37-62, doi: 10.1357/002224010793079004. McPhaden, M. J., 2015: Playing hide and seek with El Niño. Nature Climate Change, 5, 791-795, doi:10.1038/nclimate2775. Meyers, S. D., A. Melsom, G. T. Mitchum, and J. J. O’Brien, 1998: Detection of the fast Kelvin wave teleconnection due to El Niño-Southern Oscillation. J. Geophys. Res., 103, 27,655–27,663, doi:10.1029/98JC02402. Ramp, S. R., J. L. McClean, C. A. Collins, A. J. Semtner, and K. A. S. Hays, 1997: Observations and modeling of the 1991–1992 El Nino signal off central California. J. Geophys. Res., 102, 5553–5582, doi:10.1029/96JC03050. Rudnick, D. L., K. D. Zaba, R. E. Todd, and R. E. Davis, 2016: A climatology of the California Current System from a network of underwater gliders. Prog. Oceanogr., submitted. Rykaczewski, R. R., and D. M. Checkley, 2008: Influence of ocean winds on the pelagic ecosystem in upwelling regions. Proc. Natl. Acad. Sci., 105, 1965–1970, doi: 10.1073/pnas.0711777105. Schwing, F., T. Murphree, L. DeWitt, and P. Green, 2002: The evolution of oceanic and atmospheric anomalies in the northeast Pacific during the El Niño and La Niña events of 1995–2001. Prog. Oceanogr., 54, 459–491, doi:10.1016/S0079-6611(02)00064-2. Strub, P., and C. James, 2002: The 1997–1998 oceanic El Niño signal along the southeast and northeast Pacific boundaries—An altimetric view. Prog. Oceanogr., 54, 439–458, doi: 10.1016/S0079-6611(02)00063-0. Sydeman, W. J., S. A. Thompson, J. C. Field, W. T. Peterson, R. W. Tanasichuk, H. J. Freeland, S. J. Bograd, and R. R. Rykaczewski, 2011: Does positioning of the North Pacific Current affect downstream ecosystem productivity?. Geophys. Res. Lett., 38, doi: 10.1029/2011GL047212. Todd, R. E., D. L. Rudnick, R. E. Davis, and M. D. Ohman, 2011: Underwater gliders reveal rapid arrival of El Niño effects off California’s coast. Geophys. Res. Lett., 38, doi:10.1029/2010GL046376. Zaba, K. D., and D. L. Rudnick, 2016: The 2014-2015 warming anomaly in the Southern California Current System observed by underwater gliders. Geophys. Res. Lett., 43, 1241-1248, doi:10.1002/2015GL067550. The El Niño-Southern Oscillation (ENSO) is the dominant mode of tropical Pacific climate variability at interannual timescales, with profound influences on seasonal weather and ecosystems worldwide. In particular, the physical and biological conditions along the US West Coast, an area that supports one of the most productive marine ecosystems in the world, are strongly influenced by ENSO. Specifically, during El Niño events, alongshore winds weaken and upwelling is reduced, resulting in warmer surface waters, reduced nutrient supply to the euphotic zone, and reduced biological productivity. While these conditions during El Niño events are well known, the exact mechanisms involved and the origin of event-to-event differences in ENSO impacts are not fully understood. Here, we review our current state of knowledge on ENSO and its different expressions, the mechanisms by which ENSO influences the US West Coast, and possible approaches for understanding the predictability of those impacts. Tropical Pacific interannual variations involve changes in the thermocline, namely the interface between the warmer upper ocean layer and the colder deeper ocean. In its neutral state, the tropical Pacific is characterized by a shallower thermocline in the eastern Pacific and deeper thermocline in the western Pacific, with a zonal (east-west) slope that is in equilibrium with the surface easterly wind stress. Surface waters are thus colder in the eastern Pacific “Cold Tongue,” and much warmer west of the dateline in the western Pacific “Warm Pool.” ENSO events are disruptions of this neutral state. During warm events, the El Niño phase, the easterly trades weaken, reducing upwelling in the Cold Tongue region. The thermocline deepens in the east and shoals in the west (Figure 1) and the zonal temperature gradient is reduced. The initial deepening of the eastern Pacific thermocline is achieved through the eastward propagation of downwelling Kelvin waves, excited by high-frequency winds in the form of westerly wind events (WWEs) in the western Pacific (McPhaden 1999, Roundy and Kiladis 2006), and amplified by slower-building wind anomalies (known as the Bjerknes feedback). After reaching the eastern ocean boundary, these Kelvin waves continue poleward along the coastlines of the Americas as coastally trapped Kelvin waves, depressing the thermocline, and reducing upwelling along the west coast of North and South America. The coastal wave propagation north of the Equator can clearly be seen in Figure 1 all the way to Baja California. In contrast, upwelling Kelvin waves during La Niña conditions induce a shoaling of the thermocline in the eastern equatorial Pacific and along the west coast of the Americas, resulting in increased upwelling (Simpson 1984; Lynn and Bograd 2002; Huyer et al. 2002; Bograd et al. 2009; Hermann et al. 2009; Miller et al. 2015). Figure 1. 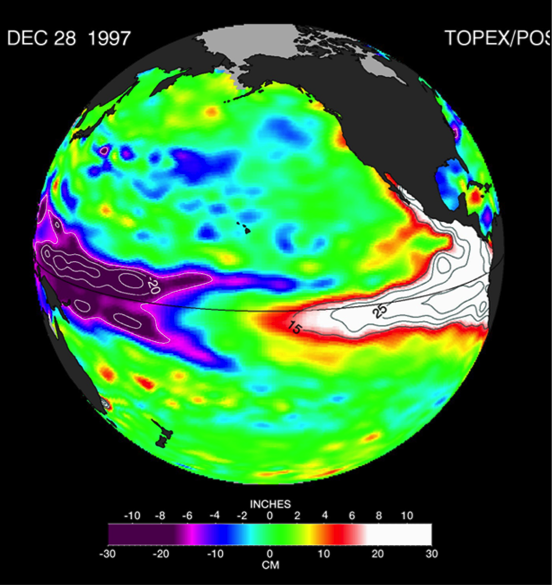 Canonical oceanic teleconnection pattern associated with coastally trapped Kelvin waves emanating from the tropical and subtropical eastern Pacific during the 1997-98 El Niño, as revealed by sea surface height altimeter observations (Credit: NASA/JPL-Caltech). These boundary-trapped waves have the potential to travel from the Equatorial region to the California Coast (and beyond) where they can alter thermocline depth, SST, mixed-layer depth, and currents. Atmospheric teleconnections, however, can also drive regional oceanic anomalies that mimic this same type of response. The changes in upwelling associated with the coastal Kelvin waves can directly impact the biogeochemistry of the waters along the US West Coast. However, the offshore scale of the waves decreases with latitude, and the waves decay while propagating northward due to dissipation and radiation of energy by the generation of westward propagating Rossby waves (Marchesiello et al. 2003). In addition, topography and bathymetry can modify the nature of the waves and perhaps partially impede their propagation at some locations, casting some doubt on the effectiveness of coastal waves of equatorial origin to substantially alter the stratification along the US West Coast and modulate the local marine ecosystem. Equatorial sea surface temperature (SST) anomalies associated with ENSO also influence remote weather and climate through large-scale atmospheric teleconnections. Variations in convection trigger atmospheric stationary Rossby wave trains that alter the Pacific North America Pattern (PNA, Figure 2), a mode of North Pacific geopotential height variability (Horel and Wallace 1981), and induce variations in the regional atmospheric circulation. In particular, El Niño events are associated with an intensification and southward shift of the Aleutian Low (AL) pressure system and changes in the eastern Pacific subtropical high, which conspire to weaken the alongshore winds off the US West Coast, resulting in reduced upwelling and warmer SST. These changes associated with the local atmospheric forcing are similar to those induced by coastal Kelvin waves of equatorial origin, making it very difficult to distinguish the relative importance of the oceanic and atmospheric pathways in this region, especially observationally. In addition, large uncertainties exist surrounding the atmospheric mid-latitude response to tropical SST anomalies. Results from a recent study based on both observations and climate model ensemble simulations indicate that uncertainties in the sea level pressure (SLP) response to ENSO arise primarily from atmospheric internal variability rather than diversity in ENSO events (Deser et al. 2017). Thus, the details of the ENSO teleconnections can vary significantly and randomly from event to event and result in important differences along the California Coast. Figure 2. Canonical wintertime atmospheric teleconnection pattern associated with ENSO as a response to tropical heating, also known as the Pacific North American (PNA) pattern, as schematically illustrated by Horel and Wallace (1981). The contour lines represent middle troposphere geopotential height anomalies that occur in response to warm SST in the tropical Pacific near the dateline during an El Niño (shaded area). The Rossby wave-like pattern includes high-pressure anomalies in the Northern Hemispheric subtropics and low-pressure anomalies in the North Pacific, with a ridge over Canada and an anomalous low-pressure region in the Southeastern US. The dark arrows depict the strengthened subtropical jets and easterlies near the dateline. The lighter arrows indicate the distorted mid-tropospheric streamlines due to troughing and ridging. As already noted by Wyrtki (1975), “No two El Niño events are quite alike.” Indeed, ENSO events differ in amplitude, duration, and spatial pattern, and several studies have suggested that such differences may play an important role in ENSO impacts (see Capotondi et al. 2015 for a review). Special emphasis has been given to the location of the maximum equatorial SST anomalies, as this is an aspect that is readily observed and may influence atmospheric teleconnections (Ashok et al. 2007; Larkin and Harrison 2005). Although the longitudinal position of the maximum SST anomalies along the equator varies from event to event in a quasi-continuum fashion, for practical purposes, events are often grouped depending on whether the largest anomalies are located in the eastern Pacific (“EP” events), or in the central Pacific (“CP” events). Here, we use the relative amplitudes of SST anomalies in the Niño-3 (5°S-5°N, 150°W-90°W) and Niño-4 (5°S-5°N, 160°E-150°W) regions to classify the events as “EP” or “CP”. Figure 3 shows the equatorial profiles of SST anomalies for the two groups of events in the Simple Ocean Data Assimilation (SODA; Carton and Giese 2008) reanalysis over the period 1958-2007 (Figure 3a) and in 500 years of a pre-industrial control simulation of the National Center for Atmospheric Research (NCAR) Community Climate System Model version 4 (CCSM4; Figure 3b). We notice that there is a large overlap between the two groups of events, which is indicative of the large spread in event longitudinal distribution, although events peaking in the eastern Pacific can achieve larger amplitudes than those peaking in the central Pacific. This difference in amplitude is not as pronounced in the precipitation profiles (Figure 3c), suggesting that in spite of their weaker SST anomaly signature, CP events may still have a large influence on the atmosphere due to their position in a region of warmer background SST. Figure 3. a) Equatorial SST anomaly profiles for El Niño events with largest SST anomalies in the Niño-3 region (EP events, thin dashed orange lines) and in the Niño-4 region (CP events, thin dashed blue lines) from the SODA ocean reanalysis over the period 1958-2007. The thick red and blue lines are the composites of the thin orange and blue lines, respectively. b) Same as in a, but for a 500-year preindustrial simulation of the NCAR-CCSM4 climate model. c) Same as in b, but for precipitation anomalies rather than SST anomalies. The a), b) and c) panels are adapted from Capotondi (2013). d) Tropical SST anomaly pattern, or “sensitivity pattern,” that exerts the largest influence on the PNA (the “+” and “-“ signs indicate the PNA highs and lows as shown in Figure 2), as computed by Barsugli and Sardeshmukh (2002) using ensembles of atmospheric model simulations forced by a set of SST anomaly patches over the tropical Pacific. Panel c) is adapted from Barsugli and Sardeshmukh (2002). Do different types of ENSO events have different impacts on the climate and marine ecosystems of the US West Coast? In terms of atmospheric teleconnections, “canonical” EP events have been associated with changes in the AL, while CP events may produce a strengthening of the second mode of North Pacific atmospheric variability, the North Pacific Oscillation (NPO; Di Lorenzo et al. 2013). AL variability is associated with the Pacific Decadal Oscillation, while the NPO appears to provide the atmospheric forcing for the North Pacific Gyre Oscillation (Di Lorenzo et al. 2008), a mode of variability that is largely correlated with biologically relevant quantities along the West Coast of the US. However, the event-to-event differences in teleconnections, associated with intrinsic atmospheric variability, may obscure differences in atmospheric response to different event types. EP and CP events have different subsurface characteristics as well so that the oceanic pathways between the tropical Pacific and the US West Coast can also be expected to differ in the two cases. While EP events are characterized by large equatorial thermocline anomalies across the basin, which evolve consistently with the recharge oscillator paradigm (Jin 1997), thermocline depth anomalies during CP events tend to be confined to the central part of the basin and do not undergo the large variations associated with the meridional warm water volume transport. As a result, the Kelvin wave signature in the eastern equatorial Pacific, and the resulting amplitude of the coastal Kelvin wave can be expected to be weaker during CP events. Indeed, a recent study (Fischer et al. 2015) has shown that temperature anomalies (and associated zooplankton composition) in the northern California Current responded very rapidly to EP El Niño events with a peak during boreal winter, whereas CP events were accompanied by a delayed response with a peak during boreal spring. The most recent 2015/16 El Niño provides another compelling example of diversity in ENSO influences. In spite of the magnitude of the event, which was comparable to the previous two extreme events on record, the 1982/83 and 1997/98, the changes in temperature, thermocline/nutricline depth, and alongshore winds associated with this event were much smaller than during the two previous cases (Jacox et al. 2016). These differences are perhaps due to the unique nature of this event, whose spatial pattern has elements of both EP and CP El Niño types, with, in particular, a weaker thermocline depth anomaly in the eastern equatorial Pacific relative to the 1982/83 and 1997/98 cases. This question remains open and is the subject of intense research. How well can we predict different types of ENSO events? Several studies have attempted to determine specific precursors for EP- and CP-type events. SST and wind stress anomalies propagating southwestward from the Southern California coast to the central equatorial Pacific, a pattern known as the “Pacific Meridional Mode” (PMM; Chiang and Vimont 2004) has been suggested as a possible precursor for CP events (Yu and Kim 2011; Vimont et al. 2014), while SST and wind stress anomalies extending northward along the coast of South America toward the eastern equatorial Pacific (the “South Pacific Meridional Mode” or SPMM; Zhang et al. 2014) have been considered as candidate precursors for EP-type events. While these modes of variability do produce initial SST anomalies either in the central or eastern Pacific, these anomalies can propagate along the equator and maximize at a different longitude in the mature phase of the event. For example, the strong 1982/83 EP El Niño developed from anomalous SSTs in the central Pacific in the late spring of 1982, which propagated eastward to achieve their largest amplitude near the South American coast in the following winter (Xue and Kumar 2016). In late spring 2015, on the other hand, anomalies exceeding 2°C appeared in the far eastern Pacific and then propagated westward to reach their largest amplitude in the central Pacific in winter (Xue and Kumar 2016). While several studies have emphasized SST precursors, thermocline conditions two seasons prior to the peak of an event appear to play an important role in the development of the two types of events (Capotondi and Sardeshmukh 2015). Deeper than average initial thermocline conditions in the eastern Pacific favor EP-type events and shallower than average eastern Pacific thermocline depth favors CP-type events. The results of Capotondi and Sardeshmukh (2015) were obtained using a combination of multiple linear regressions and linear inverse modeling (Penland and Sardeshmukh 1995), thus objectively providing the initial state that will optimally evolve, two seasons later, in either an EP- or CP-type event. Given the remaining uncertainties in the exact triggers of ENSO diversity, as well as the large noise level of atmospheric teleconnections, how can we isolate the predictable component of the ENSO influence on the US West Coast physical and biogeochemical conditions in the Pacific? In other words, even if we could perfectly predict ENSO in all its diversity and atmospheric teleconnections, how well could we predict the ecosystem responses? One possible approach is to determine the SST pattern to which a given target quantity (e.g., a mode of atmospheric variability or some local ecosystem forcing function) is most sensitive. The SST anomalies that are most effective in influencing specific “target” regions do not necessarily coincide with the anomalies typical of “canonical” ENSO events (Rasmussen and Carpenter 1982). In fact, as shown by Barsugli and Sardeshmukh (2002) the PNA pattern is particularly sensitive to SST anomalies in the Niño-4 region rather than the Niño-3 region where canonical “EP” events typically peak (Figure 3d). This implies that weaker CP El Niño events may exert a comparable influence on the sensitivity pattern relative to stronger EP events, and be as (if not more) effective in influencing atmospheric teleconnections like the PNA (compare Figures 3a,b with Figure 3d). Similar sensitivity patterns could be determined for key regional forcing function along the US West Coast, either using the approach outlined in Barsugli and Sardeshmukh (2002) or via multiple linear regression (e.g., Capotondi and Sardeshmukh 2015). In summary, ENSO can provide a large source of potential predictability for the physics and the biology of the US West Coast. However, in light of the large uncertainties associated with ENSO diversity and atmospheric teleconnections, novel approaches need to be developed to isolate the robust predictable components of ENSO influences and inform forecast development. Ashok, K., S. K. Behera, S. A. Rao, H. Weng, and T. Yamagata, 2007: El Niño Modoki and its possible teleconnections. J. Geophys. Res., 112, doi:10.1029/2006JC003798. Barsugli, J. J., and P. D. Sardeshmukh, 2002: Global atmospheric sensitivity to tropical SST anomalies throughout the Indo-Pacific basin. J. Climate, 15, 3427-3442, doi: 10.1175/1520-0442(2002)015<3427:GASTTS>2.0.CO;2. Bograd, S. J., I. Schroeder, N. Sarkar, X. Qiu, W. J. Sydeman, and F. B. Schwing, 2009: Phenology of coastal upwelling in the California Current. Geophys. Res. Lett., 36, doi: 10.1029/2008GL035933. Capotondi, A., 2013: ENSO diversity in the NCAR CCSM4 climate model. J. Geophys. Res. Oceans, 118, 4755-4770, doi:10.1002/jgrc.20335. Capotondi, A., and P. D. Sardeshmukh, 2015: Optimal precursors of different types of ENSO events. Geophys. Res. Lett., 42, doi:10.1002/2015GL066171. Carton, J. A., and B. S. Giese, 2008: A reanalysis of ocean climate using simple ocean data assimilation (SODA). Mon. Wea. Rev., 136, 2999-3017, doi:10.1175/2007MWR1978.1. Chiang, J. C. H., and D. J. Vimont, 2004: Analogous Pacific and Atlantic meridional modes of tropical atmosphere-ocean variability. J. Climate, 17, 4143-4158, doi: 10.1175/JCLI4953.1. Deser, C., I. R. Simpson, K. A. McKinnon, and A. S. Phillips, 2017: The Northern Hemisphere extra-tropical atmospheric circulation response to ENSO: How well do we know it and how do we evaluate models accordingly? J. Climate, submitted. Fischer, J. L., W. T. Peterson, and R. R. Rykaczewski, 2015: The impact of El Niño events on the pelagic food chain in the northern California Current. Glob. Change Bio., 21, 4401-4414, doi:10.1111/gbc.13054. Hermann, A. J., E. N. Curchitser, D. B. Haidvogel, and E. L. Dobbins, 2009. A comparison of remote vs. local influence of El Nino on the coastal circulation of the northeast Pacific. Deep Sea Res. Part II: Top. Stud. Oceanogr., 56, 2427-2443, doi: 10.1016/j.dsr2.2009.02.005. Horel, J. D., and J. M. Wallace, 1981: Planetary-scale atmospheric phenomena associated with the Southern Oscillation. Mon. Wea. Rev., 109, 813-829, doi: 10.1175/1520-0493(1981)109<0813:PSAPAW>2.0.CO;2. 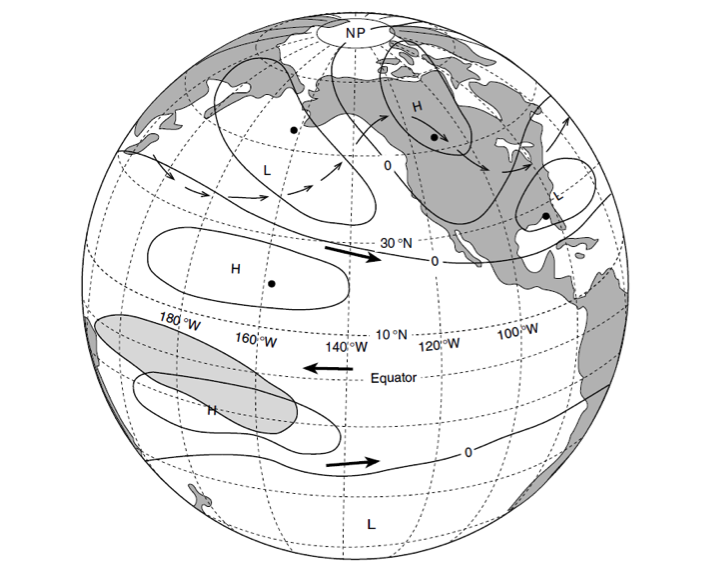 Jin, F.-F., 1997: An equatorial ocean recharge paradigm for ENSO. Part I: Conceptual model. J. Atmos. Sci., 54, 811-829, doi: 10.1175/1520-0469(1997)054<0811:AEORPF>2.0.CO;2. Larkin, N. K., and D. E., Harrison, 2005: On the definition of El Niño and associated seasonal average U.S. weather anomalies. Geophys. Res. Lett. 32, doi:10.1029/2005GL022738. Lynn, R. J., and S. J. Bograd, 2002: Dynamic evolution of the 1997–1999 El Niño–La Niña cycle in the southern California Current system. Prog. Oceanogr., 54, 59-75, doi: 10.1016/S0079-6611(02)00043-5..
Marchesiello, P., J. C. McWilliams, and A. Shchepetkin, 2003. Equilibrium structure and dynamics of the California Current System. J. Phys. Oceanogr., 33, 753-783, doi: 10.1175/1520-0485(2003)33<753:ESADOT>2.0.CO;2. McPhaden, M. J., 1999: Climate oscillations – Genesis and evolution of the 1997-98 El Niño. Science, 283, 950-954. Penland, C., and P. D. Sardeshmukh, 1995: The optimal growth of tropical sea surface temperature anomalies. J. Climate, 8, 1999-2024, doi: 10.1175/1520-0442(1995)008<1999:TOGOTS>2.0.CO;2. Rasmusson, E. M., and T. H. Carpenter, 1982: Variations in tropical sea-surface temperature and surface wind fields associated with the Southern-Oscillation El Niño. Mon. Wea. Rev., 110, 354-384, doi: 10.1175/1520-0493(1982)110<0354:VITSST>2.0.CO;2. Roundy, P. E., and G. N. Kiladis, 2006: Observed relationships between intraseasonal oceanic Kelvin waves and atmospheric forcing. J. Climate, 19, 5253-5272. Simpson, J. J., 1984. El Nino‐induced onshore transport in the California Current during 1982‐1983. Geophys. Res. Lett., 11, 233-236, doi: 10.1029/GL011i003p00233. Vimont, D. J., M. A. Alexander, and M. Newman, 2014: Optimal growth of central and east Pacific ENSO events. Geophys. Res. Lett., 41, doi:10.1002/2014GL059997. Wyrtki, K., 1975: El Niño – The dynamic response of the equatorial Pacific Ocean to atmospheric forcing. J. Phys. Oceanogr., 5, 572-584, doi: 10.1175/1520-0485(1975)005<0572:ENTDRO>2.0.CO;2. Xue, Y., and A. Kumar, 2016: Evolution of the 2015-16 El Niño and historical perspective since 1979. Sci. China, Earth Sci., doi:10.1007/s11430-016-0106-9. Yu., J.-Y., and S. T. Kim, 2011: Relationships between extratropical sea level pressure variations and the central-Pacific and eastern-Pacific types of ENSO. J. Climate, 24, 708-720, doi: 10.1175/2010JCLI3688.1. 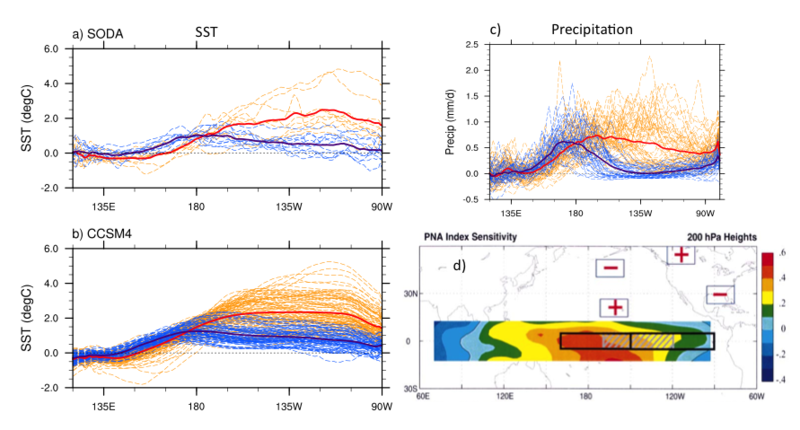 Zhang, H., A. Clement, and P. Di Nezio, 2014: The South Pacific Meridional Mode: A mechanism for ENSO-like variability. J. Climate, 27, 769-783, doi: 10.1175/JCLI-D-13-00082.1. El Niño events are one of the “most spectacular instances of interannual variability in the ocean” with “profound consequences for climate and the ocean ecosystem” (Cane 1986). Perturbations in the atmosphere directly influence the ocean with long-term effects on environmental variability in the tropical Pacific Ocean as the El Niño-Southern Oscillation (ENSO) shifts between El Niño, neutral, and La Niña states on a timescale of two to seven years. On longer timescales, teleconnections from the tropics to extratropical regions drive Pacific decadal variability, and these can be both oceanic and atmospheric in nature. Mid-latitude variability of the Pacific Decadal Oscillation (PDO) has been associated with ENSO (e.g., Newman et al. 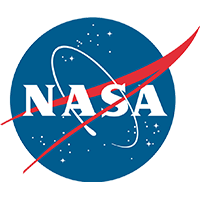 2003) and is distinguished from ENSO in part by its multidecadal timescale (20-30 years; 50 years). The PDO is dependent upon ENSO as a response to the combined effects of atmospheric noise (Newman et al. 2003), as well as the asymmetry of the ENSO cycle (Rodgers et al. 2004). Therefore, when discussing decadal variability of the northeast Pacific, we are referring to the delayed impacts of ENSO. Given the complex influence of tropical climate on northeast Pacific ecosystems, there is significant overlap between ENSO signals and higher frequency modes of the PDO Index. It is widely recognized that interactions between these two climate modes drive substantial ecosystem variability on a range of time and space scales. Large regime shifts in the North Pacific that have reverberated throughout the ecosystem, from physics to fish, are recurring patterns now associated with low-frequency changes in sea surface temperature (SST) that characterize the PDO (e.g., Mantua et al. 1997). Some of the higher-frequency fluctuations in ecosystem variables of the northeast Pacific that have not been successfully attributed to PDO or ENSO are now thought to be driven by an intermediate mode of variability called the North Pacific Gyre Oscillation (NPGO). While the PDO is characterized as the first empirical orthogonal function (EOF) of SST, NPGO is defined as the first EOF of both SST and sea surface height (SSH) anomalies (Di Lorenzo et al. 2008). Compared to PDO and ENSO, NPGO is more closely tied to variations in salinity, nutrient upwelling, and chlorophyll a (chl-a) in the long-running California Cooperative Oceanic Fisheries Investigations (CalCOFI) time-series. DiLorenzo et al. 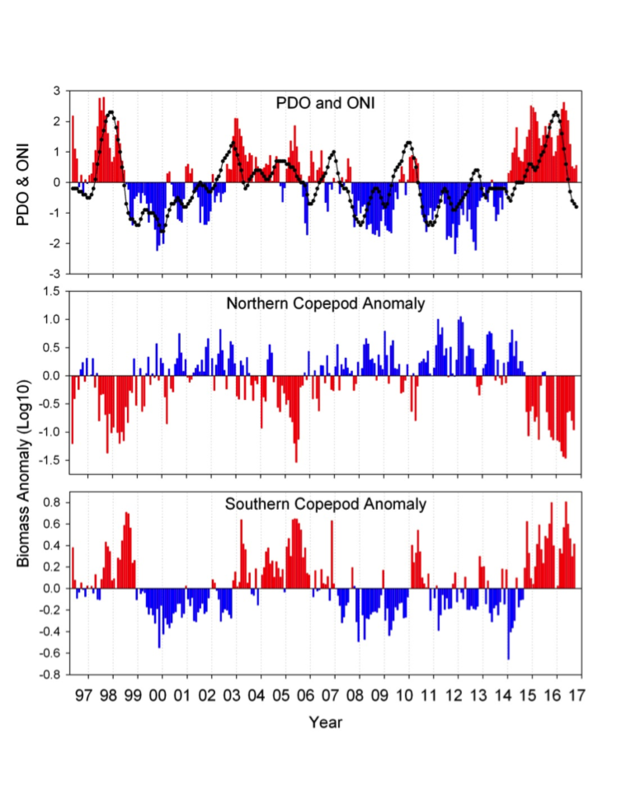 (2008) suggest that major ecosystem regime shifts require a simultaneous and opposite sign reversal of the NPGO and PDO, as was seen shortly after the massive ENSO event of 1997/98, and all three indices relate back to dynamics in the tropical Pacific. The struggle is to understand how these low- to high(er)-frequency modes of variability in the climate and physics drive fluctuations in biogeochemistry and coastal ecology. As discussed by Jacox et al. (this post), there is an expected or canonical set of physical conditions associated with ENSO in the California Current System (CCS). This physical response to ENSO generally includes: 1) changes in surface wind stress that alter the strength of coastal upwelling and downwelling; 2) remote oceanic forcing by coastally trapped waves that propagate poleward along the US West Coast and modify thermocline depth and coastal stratification; and 3) changes to alongshore advection (Jacox et al., this post). The ecological response of the coastal marine environment includes changes in primary production and the community composition of plankton and higher trophic levels that can be directly or more subtly related to these physical factors. Primary production is driven by vertical nutrient flux to well-lit surface waters; nutrient supply is related to upwelling magnitude, upwelling source depth, and nutrient concentrations at the source depth. ENSO-related processes are also important for interannual and seasonal variability of oxygen concentrations and carbonate biogeochemistry on the Washington and Oregon Shelves (Siedlecki et al. 2015). In this article, we highlight some of the modeling and observational studies that have successfully attributed ENSO-like variability to specific impacts on the biogeochemistry and lower-trophic level organisms of the northeast Pacific and CCS. Numerical models are widely employed to diagnose climatic forcing of the physical and biogeochemical conditions of the northeast Pacific. For instance, using a fully coupled ocean and biogeochemical model, Xiu and Chai (2014) found that after accounting for atmospheric effects, the air-sea flux and resulting pCO2 of sea water in the Pacific was significantly correlated (0.6) to the Multivariate ENSO Index (MEI) with a lag of ten months. Similarly, Wong et al. (2010) found that sea surface pCO2 was significantly correlated with the MEI in the northeast Pacific. Biogeochemical models of different complexity have also highlighted the connection between PDO and the interannual variability of air-sea CO2 fluxes (e.g., McKinley et al. 2006). These studies also demonstrate that the individual components controlling surface ocean pCO2 in the northeast Pacific respond to PDO with significant amplitudes, but that their combined influence has a relatively small effect on the CO2 fluxes in this region. Xiu and Chai (2014) showed that the dominant driver of North Pacific pCO2 variability is anthropogenic CO2, whereas air-sea CO2 flux is more closely correlated with the PDO and the NPGO. In the coastal regions of the northeast Pacific, such as the CCS, ENSO significantly impacts the nutrient supply due to modifications of upwelling and source waters mentioned above (Jacox et al., this post). At the peak of the El Niño season in December-January, Frischknecht et al. (2016) found a pattern in the development of chlorophyll events through a modeling study focused on the CCS. Around the onset of the El Niño year, chlorophyll anomalies were consistently low. This pattern was even more pronounced during the spring of the following year. In spring of the second year (i.e. with the onset of the upwelling season), all events shared the development of a strong negative chlorophyll anomaly. Frischknecht et al. (2016) attributed this phenomenon to a persistent lack of nutrients to support production driven by a combination of physical mechanisms impacting the thermocline (Jacox et al. 2015; 2016; this post) and light limitation at the onset of the upwelling season. Consequently, El Niño events disrupt the biogeochemical cycling in these systems for months, even years, after the event is over. The observations in Oregon, from the Newport line in Fisher et al. (2015), detail the nitrate anomalies from 1995 to 2015, and the nitrate anomalies remain negative long after the Niño-3.4 SST anomaly suggested that the event was over. This may contribute to the success surrounding seasonal forecast systems like J-SCOPE, in which forecasts of biogeochemical parameters (e.g., bottom oxygen) outperformed those of physical variables (e.g., SST) in terms of predictive skill (Siedlecki et al. 2016). The relationship between ENSO and nutrient availability from source waters can serve as an analog for oxygen and carbon content. We would expect from observed stoichiometry that when nutrients are low, oxygen is relatively high and carbon is low. In California, this has been documented: El Niño events correlate to higher oxygen and pH, while La Niña events are correlated with lower oxygen and pH (e.g., Nam et al. 2011). In the northern CCS along the Washington and Oregon coasts, the interannual variability in oxygen content of source waters has been correlated to NPGO more than ENSO (Peterson et al. 2013). Consistent with these findings, oxygen has been increasing since 2010 and aragonite saturation state (a measure of the availability of carbonate ion to calcifying organisms) has been elevated in 2015-2016 relative to the year prior in both Oregon and California (McClatchie et al. 2016). As an eastern boundary upwelling region, the CCS is among the most productive in the world in terms of primary production and fisheries. The suppression of nutrient availability described above can be thought of as reduced “upwelling efficacy” that leads to reduced primary production in the CCS, while La Niña often has the opposite effect due to associated increases in the upwelling efficacy (Jacox et al. 2015). In the southern CCS, the 1997/1998 El Niño led to a significant deepening of the nutricline, with the strongest effects along CalCOFI Line 80, and a pronounced regional reduction of primary production (Bograd and Lynn 2001). The uptake of silicon increased in central California (Santa Barbara Channel) during the onset of the 1997 event, suggesting that diatoms were major drivers of the primary productivity prior to the 1998 spring season when overall productivity was reduced in response to density surface adjustments (Shipe and Brzezinski 2003). Despite reductions in surface layer primary productivity in response to the El Niño, export ratios of particulate organic carbon and particulate organic nitrogen increased during the spring of 1998 relative to the 1994-1997 period, while biogenic Si flux decreased in response to the El Niño (Shipe et al. 2002). This counterintuitive result appears to be due to an increase in particulate material exported to depth. By 1999, ratios of Si/N and Si/C had not recovered to pre-El Nino conditions. Warmer waters and changes in nutrient supply associated with ENSO can lead to phytoplankton community shifts such as an influx of coccolithophores or an increase in harmful algal blooms (HABs). The most common harmful algal bloom organism in the CCS is the diatom genus Pseudo-nitzschia. McCabe et al. (2016) recently observed a link between the Oceanic Niño Index (ONI), the Pseudo-nitzschia growth rate anomaly determined from temperature-growth relationships, and domoic acid levels in razor clams over a 16-year period (Figure 1), implicating El Niño-driven warming in the unprecedented 2015 HAB along the US West Coast. Similarly, McKibben et al. (2017) linked warm phases of the PDO and ONI to domoic acid in shellfish in the northern CCS. The toxic blooms off Newport in 2015 were the most prolonged (late-April through October 2015) and among the most toxic ever observed off Oregon (Du et al. 2015; McKibben et al. 2017). Conversely, Santa Barbara Basin sediment trap data showed no significant correlation between a 15-year record of domoic acid levels and PDO, NPGO, or ENSO indices; however, there was a strong change point in the frequency and toxicity of these blooms following the 1997/1998 ENSO (Sekula-Wood et al. 2011). Figure 1. Records of razor clam toxicity and the potential growth rate anomaly for Pseudo-nitzschia spp. are plotted below the Oceanic Niño Index (gold = El Niño, blue = La Niña, gray = neutral) to illustrate the association between ENSO events and harmful algal blooms in the northern CCS. The potential for Pseudo–nitzschia growth does not always coincide with records of high domoic acid in shellfish, e.g., 1997 El Niño. Figure adapted from McCabe et al. (2016). Off the Oregon coast, a 21-year time-series of fortnightly hydrography and plankton sampling of shelf and slope waters showed that the water masses (and thus the plankton) that dominate shelf and slope waters vary seasonally, interannually, and on decadal scales. Thus, it is a simple matter to track the timing of summer or winter arrival, ENSO events, and changes in sign of the PDO (Figure 2). During summer months, northerly winds drive surface waters offshore (Ekman transport), which are replaced by the upwelling of cold nutrient-rich waters that penetrate the continental shelf and fuel high primary production. Northerly winds also enhance the southward transport of water (and plankton) from the coastal Gulf of Alaska into the coastal northern CCS, and these species are referred to as ‘cold water’ or ‘northern species.’ During winter, the winds reverse and the poleward Davidson current transports warm coastal water from southern California to the northern CCS, bringing with it ‘southern species’ of plankton. On longer timescales (5-10 years), cold-water, northern copepods are largely replaced by warm-water, southern copepods during El Niño events (Fisher et al. 2015) and during the positive phase of the PDO (Keister et al. 2011). Incorporating the physiological response of these zooplankton groups into biogeochemical-ecosystem models (in addition to the effects of physical transport) will be essential for advancing our predictive capacity of plankton communities in the CCS. Figure 2. Monthly time series of the Pacific Decadal Oscillation and Oceanic Niño Index (upper) and monthly-averaged biomass anomalies of northern copepods (middle) and southern copepods (lower). Note the high coherence between the PDO and ONI with the copepod time series – positive anomalies of northern copepods are correlated with negative PDO and ONI; positive anomalies of southern copepods are correlated with positive PDO and ONI. 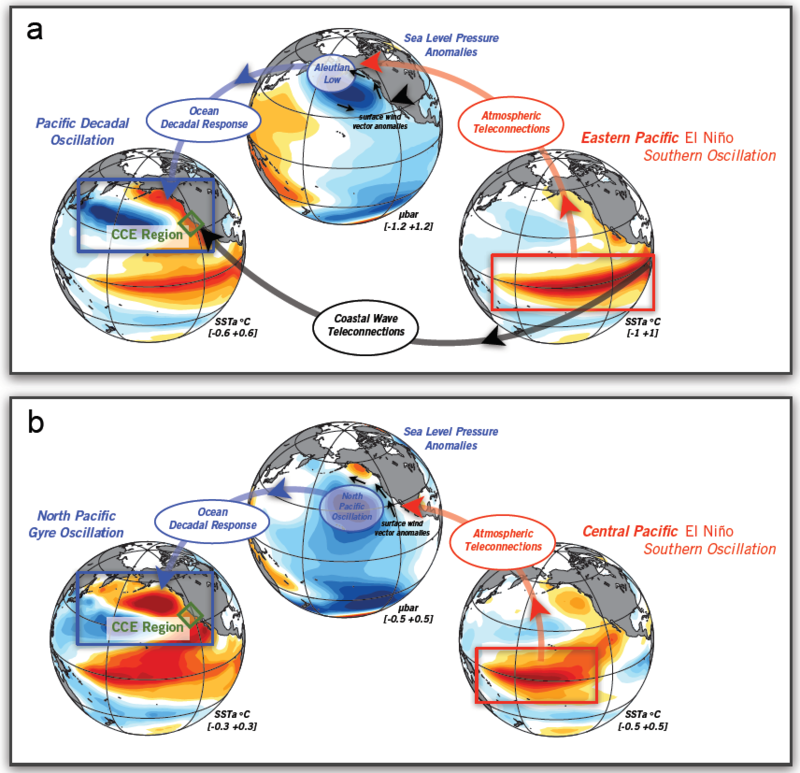 State-of-the-art models, in situ measurements, and available satellite observations are all required to adequately characterize short- and long-term physical dynamics associated with ENSO and Pacific decadal variability. Seasonal-to-interannual forecasting of the ecosystem response to ENSO in the CCS and throughout the northeast Pacific will depend on our understanding of how interannual climate variability alters ocean biogeochemistry and productivity at the base of the food web, and therefore how predictive models should be modified to capture the dynamic range introduced by these anomalous events. Unusual warm water anomalies, as observed during large ENSO events, may serve as important analogs for assessing the impacts of long-term warming on the pelagic ecosystem of the CCS. Regional simulations suggest similarities between the physical drivers leading to biogeochemical variability from ENSO and those in projected future upwelling systems (Rykaczewski and Dunne 2010). Further exploration of the mechanisms and predictive skill of forecasts on seasonal timescales will enhance our understanding and improve our projections further into the future. Global climate models are unable to anticipate anomalous warming events such as major ENSO events. As such, they are unable to detect large-scale events related to shifts in the distribution of pelagic species or track ecological changes associated with such events. Furthermore, the evaluation of model-based forecasts and projections of ecosystem variations and changes across timescales requires that long-term physical, biogeochemical, and ecological observation programs are maintained and others initiated. High-resolution modeling approaches for forecasts and projections should also be prioritized, so that ecosystem impacts of future climate anomalies can be anticipated and understood in greater detail. Bograd, S. J., & Lynn, R. J. (2001). Physical‐biological coupling in the California Current during the 1997–99 El Niño‐La Niña Cycle. Geophysical Research Letters, 28(2), 275-278. Cane, M. A., S. E. Zebiak, and S. C. Dolan, 1986: Experimental forecasts of El Niño. Nature 321, 827–832, doi:10.1038/321827a0. 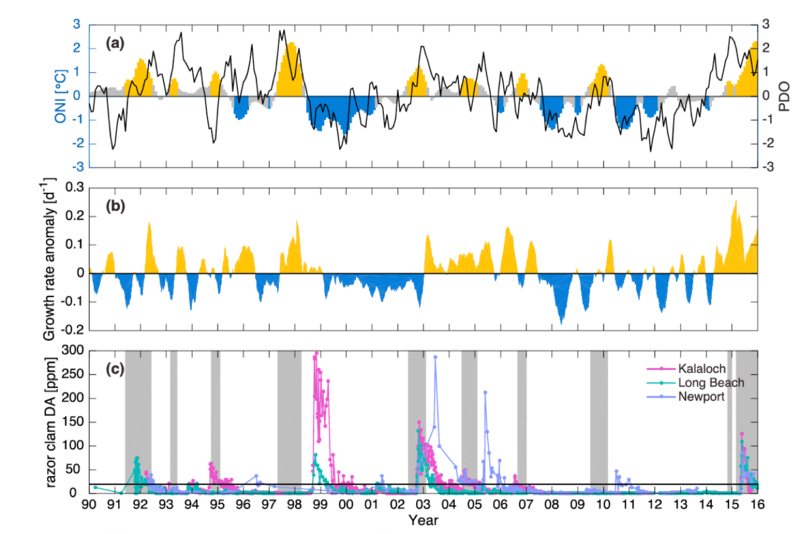 Du, X., W. Peterson, and L. O’Higgins, 2015: Interannual variations in phytoplankton community structure in the northern California Current during the upwelling seasons of 2001-2010. Mar. Ecol. Prog. Ser., 519, 75-87, doi: 10.3354/meps11097. Fisher, J. L., W. T. Peterson, and R. Rykaczewski, 2015: The impact of El Niño events on the pelagic food chain in the northern California Current. Global Change Bio., 21, 4401-4414, doi:10.1111/gbc.13054. Frischknecht, M., M. Münnich, and N. Gruber, 2016: Local atmospheric forcing driving an unexpected California Current System response during the 2015–2016 El Niño, Geophys. Res. Lett., 43, doi:10.1002/2016GL071316. Jacox, M. G., J. Fiechter, A. M. Moore, and C. A. Edwards, 2015: ENSO and the California Current coastal upwelling response. J. Geophys. Res., 120, 1691–1702, doi: 10.1002/2014JC010650..
Jacox, M., E. L. Hazen, K. D. Zaba, D. L. Rudnick, C. A. Edwards, A. M. Moore, and S. J. Bograd, 2016: Impacts of the 2015–2016 El Niño on the California Current System: Early assessment and comparison to past events. Geophys. Res. Lett. 43, 7072-7080, doi:10.1002/2016GL069716. Keister, J. E., E. Di Lorenzo, C. A. Morgan, V. Combes, and W. T. Peterson, 2011: Zooplankton species composition is linked to ocean transport in the Northern California Current. Glob. Change Bio., 17, 2498-2511, doi: 10.1111/j.1365-2486.2010.02383.x. Liu, Z., and M. Alexander, 2007: Atmospheric bridge, oceanic tunnel, and global climatic teleconnections. Rev. Geophy., 45, doi: 10.1029/2005RG000172. Mantua, N. J., S. R. Hare, Y. Zhang, J. M. Wallace, and R. C. Francis, 1997: A Pacific interdecadal climate oscillation with impacts on salmon production. Bull. Amer. Meteorol. Soc., 78, 1069–1079, doi: 10.1175/1520-0477(1997)078<1069:APICOW>2.0.CO;2. McCabe, R. M., and Coauthors, 2016: An unprecedented coastwide toxic algal bloom linked to anomalous ocean conditions. Geoph. Res. Lett., 43, doi: 10.1002/2016GL070023. McClatchie, S., A. R. Thompson, S. R. Alin, S. Siedlecki, W. Watson, and S. J. Bograd, 2016: The influence of Pacific Equatorial Water on fish diversity in the southern California Current System. J. Geophy. Res., 121, 6121-6136, doi: 10.1002/2016JC011672. McKibben, S. M., W. Peterson, M. Wood, V. L. Trainer, M. Hunter, and A. E. White, 2017: Climatic regulation of the neurotoxin domoic acid. Proc. Nat. Acad. Sci., 114, 239-244, doi: 10.1073/pnas.1606798114. Mckinley, G.A., and Coauthors, 2006: North Pacific carbon cycle response to climate variability on seasonal to decadal timescales. J. Geophy. Res., 111, doi: 10.1029/2005JC003173. Nam, S., H. J. Kim, and W. Send, 2011: Amplification of hypoxic and acidic events by La Niña conditions on the continental shelf off California. Geophy. Res. Lett., 38, doi: 10.1029/2011GL049549. Newman, M., G. P. Compo, and M. A. Alexander, 2003: ENSO-forced variability of the Pacific decadal oscillation. J. Climate, 16, 3853-3857, doi: 10.1175/1520-0442(2003)016<3853:EVOTPD>2.0.CO;2. Peterson, J. O., C. A. Morgan, W. T. Peterson, and E. Di Lorenzo, 2013: Seasonal and interannual variation in the extent of hypoxia in the northern California Current from 1998–2012. Limnol. Oceanogr., 58, 2279-2292, doi: 10.4319/lo.2013.58.6.2279. Rodgers, K. B., P. Friederichs, and M. Latif, 2004: Tropical Pacific decadal variability and its relation to decadal modulations of ENSO. J. Climate, 17, 3761-3774, doi: 10.1175/1520-0442(2004)017<3761:TPDVAI>2.0.CO;2. Rykaczewski, R. R., and J. P. Dunne, 2010: Enhanced nutrient supply to the California Current Ecosystem with global warming and increased stratification in an earth system model. Geophy. Res. Lett., 37, doi: 10.1029/2010GL045019. Sekula-Wood, E., C. Benitez-Nelson, S. Morton, C. Anderson, C. Burrell, and R. Thunell, 2011: Pseudo-nitzschia and domoic acid fluxes in Santa Barbara Basin (CA) from 1993 to 2008. Harmful Algae, 10, 567–575, doi: 10.1016/j.hal.2011.04.009. Shipe, R. F., Passow, U., Brzezinski, M. A., Graham, W. M., Pak, D. K., Siegel, D. A., & Alldredge, A. L. (2002). Effects of the 1997–98 El Nino on seasonal variations in suspended and sinking particles in the Santa Barbara basin. Progress in Oceanography, 54(1), 105-127. Shipe, R. F., and M. A. Brzezinski, 2003: Siliceous plankton dominate primary and new productivity during the onset of El Niño conditions in the Santa Barbara Basin, California. J. Mar. Sys., 42, 127-143, doi: 10.1016/S0924-7963(03)00071-X. Siedlecki, S. A., N. S. Banas, K. A. Davis, S. Giddings, B. M. Hickey, P. MacCready, T. Connolly, and S. Geier, 2015: Seasonal and interannual oxygen variability on the Washington and Oregon continental shelves. J. Geophy. Res., 120. 608-633, doi: 10.1002/2014JC010254. Siedlecki, S. A., I. C. Kaplan, A. J. Hermann, T. T. Nguyen, N. A. Bond, J. A. Newton, G. D. Williams, W. T. Peterson, S. R. Alin, and R. A. Feely, 2016: Experiments with seasonal forecasts of ocean conditions for the northern region of the California Current upwelling system. Sci. Rep., 6, 27203, doi: 10.1038/srep27203. Valsala, V., S. Maksyutov, M. Telszewski, S. Nakaoka, Y. Nojiri, M. Ikeda, and R. Murtugudde, 2012: Climate impacts on the structures of the North Pacific air-sea CO2 flux variability. Biogeosci., 9, 477, doi: 10.5194/bg-9-477-2012. Xiu, P., and F. Chai, 2014: Variability of oceanic carbon cycle in the North Pacific from seasonal to decadal scales. J. Geophy. Res.,119, 5270-5288, doi: 10.1002/2013JC009505.